PEGIDA (Patriotic Europeans Against the Islamisation of the West) supporters gathered at Theaterplatz in Dresden, Monday, to march through the city centre in protest against Merkel’s policies on Europe’s ongoing migrant and refugee crisis. It was the first PEGIDA protest since the Paris ISIS attacks. An estimated 30,000 patriots turned out for Monday’s rally. Thousands of Germans turned out for the rally. PEGIDA continues to protest against Angela Merkel’s open border policy. Germany is expecting over one-million unvetted migrants this year! At least two of the Paris ISIS killers claimed they were refugees when they entered Europe this fall. 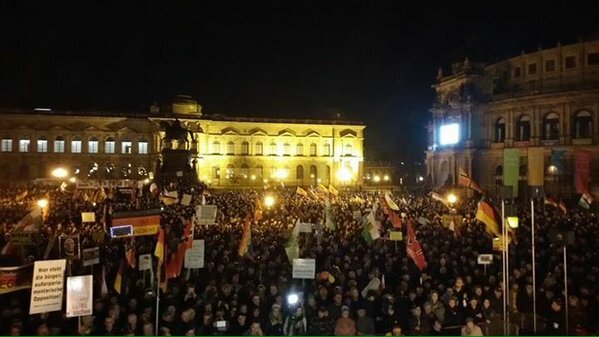 THOUSANDS of Germans turned out tonight for the weekly PEGIDA rally.